Congenital heart diseases are the most common cause of congenital malformations, with a prevalence of 8 to 10 in 1,000 live births, and could possibly explain a significant proportion of sudden fetal deaths. 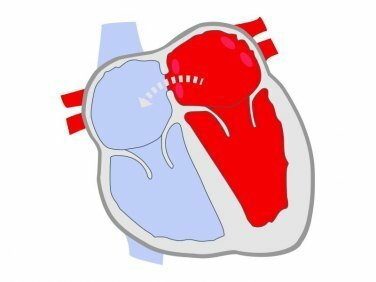 In most congenital heart diseases, no apparent cause is identified (70%-80% with possible multifactorial cause: environmental and genetic factors), and only a small percentage has been associated with an identifiable chromosomal (7%-20% of all cases) or single gene disorder (5%-7% of all cases). As for single gene causes, the great clinical heterogeneity reveals the complex relationship between genotype and phenotype of the different syndromes. Clinically complex syndromes have been described as a result of a single gene mutation, such as Holt-Oram, Williams, Alagille, DiGeorge, cardiofaciocutaneous syndromes (see RASopathies section), etc. Subjects under suspicion or with a clinical diagnosis of a syndromic congenital heart disease (20% of congenital heart diseases are associated with non-cardiac malformations) or of a non-syndromic one. When there is a family history of congenital heart disease (a parent or sibling) with a recurrence risk of having an affected child (1%-4%), it is always necessary to search for the cause of its occurrence. Familial study: A search for a mutation previously identified in a proband (relatives of patients with a syndromic or non-syndromic congenital heart disease in which a mutation has been previously identified). Holt-Oram syndrome: It is the most common form of heart-hand syndrome, with an autosomal dominant pattern. It is characterized by skeletal abnormalities in upper limbs (ranging from thumb malformations to phocomelia), congenital heart defects (ostium secundum type interatrial communication and interventricular communication) and cardiac conduction disorders. The diagnosis of the syndrome is based on clinical findings and family history. The genetic study allows confirming the diagnosis if a pathogenic mutation in the responsible gene TBX5 is identified (70% of cases). Williams syndrome: It is a rare disease with an autosomal dominant pattern, characterized by cardiac deformities (75%, with supravalvular aortic stenosis being the most frequent abnormality), intellectual disability, facial dysmorphism and characteristic cognitive and behavioral profile (linguistic and musical abilities), short stature and endocrine abnormalities. The incidence is 1 in 20,000 live births. The diagnosis is based on clinical criteria; however, the genetic study allows confirming the diagnosis in 95% of cases through the detection of the deletion of contiguous genes in the Williams-Beuren critical region (WBSCR), which includes the elastin gene (ELN). Over 99% of subjects clinically diagnosed with this syndrome present this deletion in adjacent genes. Alagille syndrome: It is a rare disease with an autosomal dominant pattern, characterized by chronic cholestasis due to a low number of intrahepatic biliary ducts, peripheral pulmonary artery stenosis, abnormal vertebral segmentation, characteristic facies, cardiac abnormalities (pulmonary stenosis or atresia, atrial and/or ventricular septal defects, tetralogy of Fallot and persistent ductus arteriosus), pigmentary retinosis and dysplastic kidneys. The prevalence of this pathology is around 1/70,000. Diagnosis is based on the signs and symptoms (chronic cholestasis and low number of interlobular biliary ducts). The genetic study allows confirming the diagnosis if a pathogenic variant in JAG1 (90% of cases) and NOTCH2 (1%-2% of cases) is found. The 20p12 microdeletion is identified by karyotype or GCH-array in 7% of cases (tests not included in the study). Genetics of congenital heart disease: the glass half empty. Fahed AC, Gelb BD, Seidman JG, Seidman CE. Circ Res. 2013 Feb 15; 112(4):707-20. Genetic basis of congenital cardiovascular malformations. Lalani SR, Belmont JW. Eur J Med Genet. 2014 Aug; 57(8):402-13. It is recommended to rule out chromosomal abnormalities (karyotype and CGH-array), either initially or jointly, in order to improve the yield of the test.This panel allows identifying some of the mutations previously associated with the development of syndromic or non-syndromic congenital heart diseases, but it does not include all the genes identified in single gene disorders associated with congenital cardiomyopathies. The use of this panel could be considered in case other more prevalent causes of congenital heart disease (e.g. the presence of chromosomal abnormalities) have been ruled out through another method, and there is suspicion of a monogenic disorder as the cause of the disease. Its yield could be higher if there is some degree of concomitant myocardial involvement.